From the start of John Major’s Premiership there were those who were ‘getting ready to be ‘disillusioned’’ and who duly arrived at that state’.1 Although such people tended to say that it was ‘not just that Major is not Mrs Thatcher’, at bottom that was exactly what it was. In style there was a return to the old days of pragmatism unseasoned by the rhetoric of the radical right, or even with the spice of ‘conviction politics’. 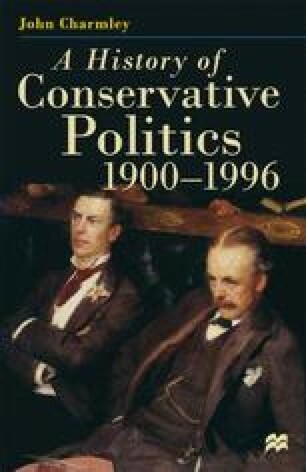 It was true that Major relaxed public spending curbs in 1991, but with an election on the horizon a little pandering to the electorate was understandable, if the pace of reform slowed down, then it could be said that it had already been doing so in the last years of the Great Lady. Mr Major successfully followed through on her policy in the Gulf War, although there were those who wondered if ‘She’ would have let President Bush stop short of Baghdad — whatever the UN resolutions said. Nor could he be be faulted over the ‘poll tax’, coming up with a sensible compromise which, if it could hardly be expected to satisfy everyone, at least took the sting out of the problem. On Europe the ride was bumpier, but not as rough as it would get in the future. All in all, Mr Major did everything which anyone save the ‘true believers’ could have wished.